...through wiping, we learn. : Azurite Armor version 1? Today Alpha rolled out the first piece of gear of Azurite Armor. Create a new character and you get a chest-piece which you can upgrade if your Heart of Azeroth (neck-piece) has a high enough level. Upgrading you neck-piece seems random, there are some quest that give you azurite power...or something like that. As you can see below, my Alpha-Troll, lvl 112, already has a lvl4 neck. So, I made several different classes to see what was going on, and they all seem to follow the same path. 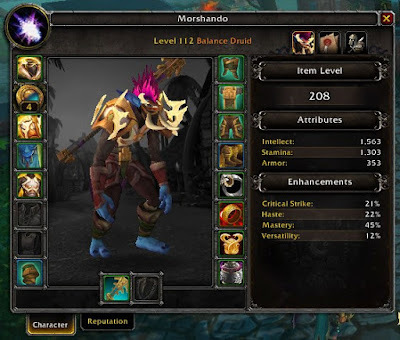 You have 4 lvl's of talents, the first level, available with a lvl1 neck, gives you a talent which does something when you kill something, and a talent for every available spec your class has, so Druids have 5 options, and Demon Hunters 3. The Balance one, Streaking Stars, has a nice idea, more damage during Incarnation when you don't cats two the same spells in a row. The problem is..291 extra damage... that does not seem to be so much, but that may just alpha. 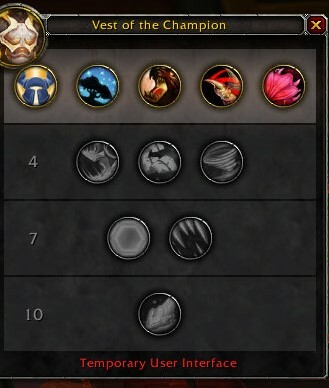 The resto talent is also interesting, swiftmend will explode your mushroom to heal a nearby target. The next level of talents, available with neck-level 4 are more role-specific. So for Druids I had a dps, a tank and a healing talent. Looking at other specs, they seem to follow the same path, with a talent for every role you could do, and if you can only have 1 or 2 roles, the other talents where more dps-orientated. The DPS-talent here almost everyone has, chance to get 97 of a random secondary stat for 10 seconds. Considering my Alpha-Troll have around 300 normally, 97 is a lot, like a mini-heroism. The other roles have similar increases. Level 7 only has two options left, for all specs/classes the same now, either a Prydaz-effect for 262... which seems low. And a heal/more speed when something dies, situational at best. The last level is a flat 5 Ilvl increase. There are some obvious problems of course, especially if you consider this system is here to replace tier-sets. The first is that you cannot change the talents as of know. Which means that if you want to have an off-spec, you got to have another piece of gear for that slot. Well, for an old player like me, that doesn't seem to bad. We used to collect different pieces of gear back in the day, so I could live with this. The bigger problem, also tying in with not changing talents is the lack of choices. It would be nice to either have choices to which talent to pick, or maybe, and that may actually be true, we have no idea, that different pieces of gear have different talents. But at the moment, it seems a little bit lackluster. Especially if it should replace tier-sets. So, as a first glance at Azurite Armor, it fails, horrible. But, this is Alpha, there is just not enough information on either what stuff does, or what the idea behind stuff is. And being a Balance Druid, they haven't gotten anything new so far, which makes playing boomkin really, really, really boring.